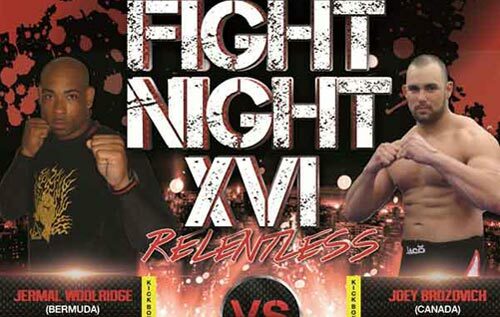 Jermal Woolridge can’t wait to entertain his home crowd when he tops the bill at the Teachers Fight Night XVI: Relentless at the Berkeley Institute Gym on April 5. Woolridge, 31, won a silver medal at the World Wushu Championships in Kuala Lumpur, Malaysia in November and has competed in the likes of Florida, Texas, Argentina and Mexico with distinction. The Smith’s resident now turns his attention to a kickboxing bout with Canada’s WXC Warrior Joey Brozovic as he headlines the biggest annual fight night on the island. The experienced Woolridge says he is well-equipped to deal with being at the top of the flyer but admits a contest on home soil adds extra spice to the occasion. He told the Bermuda Sun: “The headlining part of the pressure is nothing new for me but, of course, saying that, being a headliner in your own country just adds a little bit more pressure and everyone wants to see a devastating and fantastic performance. Sometimes things don’t happen that way and you just have to adapt to the situation. The Bermuda San-Shou Association fighter is reluctant to view this Fight Night as recognition of his success overseas. With just under a month until the bout, Woolridge, who works for Bermuda Gas, is turning up the intensity of his twice-a-day training, although ‘game-planning’ on his opponent will be done nearer the fight. “At this moment I don’t know much about him,” said Woolridge, who is also one of Nikki Bascome’s trainers at Rego’s Gym and was in Teresa Perozzi’s corner for one of her title fights last year. Local fighters Corey Boyce and Shannon Ford also go head to head. Entry is $50, with VIP tickets priced at $110. Part of the proceeds will be donated to the Dante Noel-Simmons Education Fund. Doors open at 6pm, with the action scheduled to get under way at 7pm.